Five years ago, the Friends of Indian River held our first meeting. The sixteen people who came to that first meeting didn't know what we could accomplish, but what a productive five years it has been. Please join us at our March meeting on the 16th, 7 pm to celebrate our five year anniversary. We will also have guest speaker Jim Haluska with us to discuss sea level rise and how it impacts our area. On Saturday, March 18th, we will be doing our quarterly Adopt-A-Road cleanup along Indian River Road; we will meet at the post office. And mark you calendar for Earth Day on Saturday, April 22nd at Indian River Park. Our theme will be celebrating science and examining the role native plants play in our ecosystem, followed by a service event to clean up trash and remove some invasive species around the entrance area. It is our Five Year Anniversary and we'll be celebrating our accomplishments. We'll also be looking into the future with our discussion on sea level rise. Jim Haluska, doctoral candidate in physical oceanography at ODU, will discuss factors contributing to sea level rise, where we'll see its effects, and the near-term outlook. We'll use maps to see the local areas vulnerable to tidal flooding. Afterwards, there will be light refreshments and door prizes. 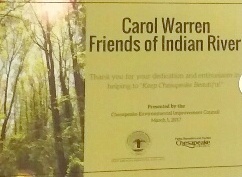 Congratulations to our own Carol Warren for receiving a Certificate of Appreciation from the Chesapeake Environmental Improvement Council for her work to improve our natural areas, including her efforts to revitalize the Plymouth Community Park and establish a canoe/kayak launch site along the Indian River. We've been briefed on the on-going meetings between the City, Aqua Virginia, elected officials, and the State Corporation Commission on the Aqua water system issues affecting the Indian River Estates neighborhood, parts of Norfolk Highlands, and the Indian River Shopping Center. There has been progress on the negotiations including plans for a new water storage tank, booster pumps, interconnection with the city water system, and ultimately replacement of parts of the aging water distribution pipes. But there is still no fully documented plan ready for review. We continue to track the progress along with the Norfolk Highlands Civic League. We had an excellent turn out for our Adopt-A-Park Clean Up at Plymouth Park last month. Special shout-out for the members from the Campostella Square Plymouth Park Civic League and the Virginia League of Conservation Voters who came out to help, and of course our ever dependable core volunteers! Overall, 17 volunteers pulled out 14 full bags of trash, 4 tires, and miscellaneous other debris - about 450 pounds of trash. At the federal level, the EPA is looking at a cut in the proposed annual budget for the Chesapeake Bay Cleanup from $73 million down to $5 million. Such a cut would impact efforts by our partners to improve the health of the Elizabeth River and our own Indian River. Please watch for more information on this as it develops.